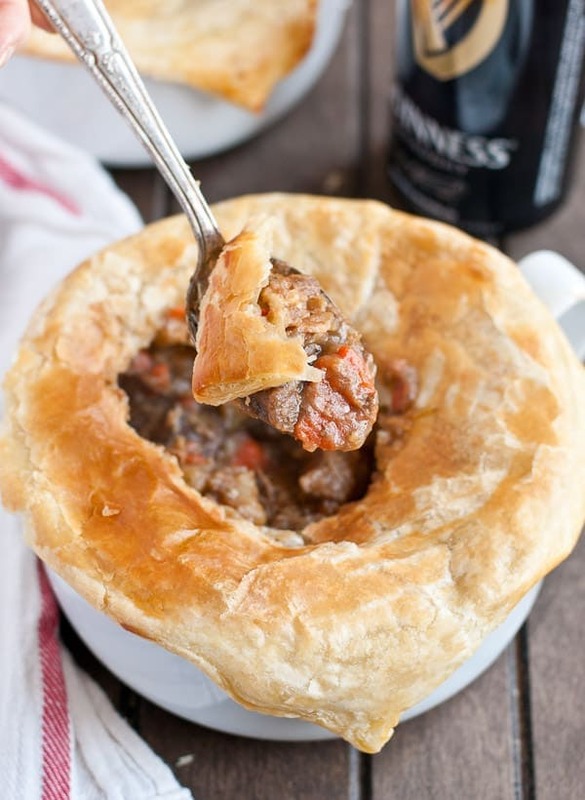 This Guinness Beef Pot Pie is loaded with tender beef and vegetables and covered in an easy, delicious puff pastry crust. A few years ago I made a Guinness Beef Stew for St. Patrick’s Day. 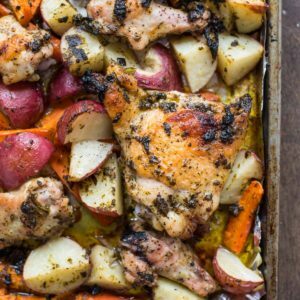 It’s still one of my favorite recipes on the site. There’s nothing quite as satisfying as a slow cooked beef and vegetable stew soaked in a stout beer broth. Weeeeell, except for maybe a slow cooked beef stew tucked under a flaky puff pastry crust. I wish I could sleep under a blanket of puff pastry. All those layers of buttery dough seem like the perfect warm, cozy comforter (and midnight snack). But since I have a feeling sleeping with carbs may be frowned upon, I guess I’ll settle for draping puff pastry over my stew instead. This ultra savory pot pie starts much the same as any beef stew. Hunks of beef, potatoes, mushrooms, carrots, and onions are slow cooked with fresh herbs, stock, and Guinness until tender and soaked in flavor. From there, the mixture is thickened slightly with cornstarch then ladled into bowls, covered in puff pastry, and baked until golden and flaky. In the meantime, prepare to grow weak in the knees as the smell of rosemary beef and vegetables fills your house. Not surprisingly, the Mr. was more than a little excited when he walked into the house the night I made these. He went straight to the stove to get a big whiff of what was simmering away in the pot. We both were head over heels for this pot pie–him for the tender hunks of beef, and me for the flavor soaked mushrooms. Be still my soul, those mushrooms. I’m drooling just thinking about them! 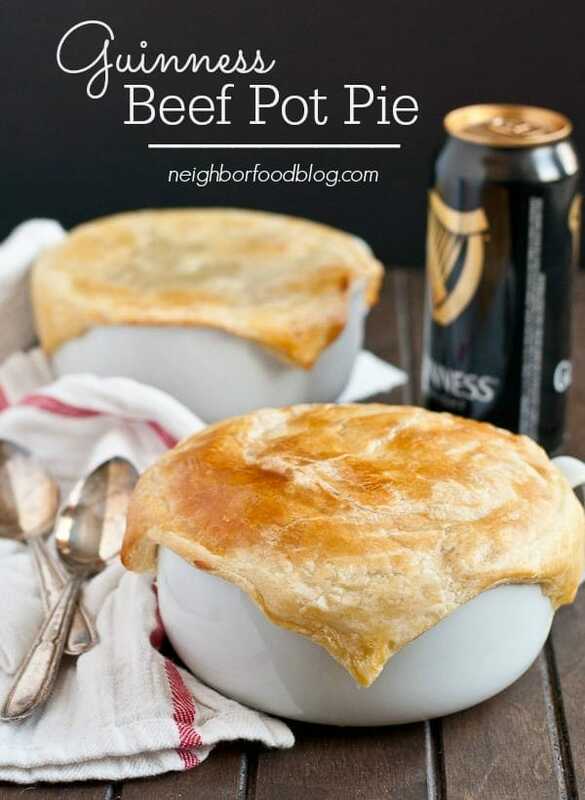 Make these Guinness Pot Pies to celebrate St. Pat’s Day this year, or just to get you through the last few weeks of spring rain and chilly temperatures. It’s sure to satisfy your nose, your tastebuds, and your belly. Heat the oil in a large pot or dutch oven over medium heat. Add the beef and brown it on all sides then remove to a plate. Add the onion, carrots, celery and potatoes and cook until starting to soften, about 5 minutes. Stir in the mushrooms and garlic and cook an additional 3-4 minutes. Add the beef back to the pot, along with the rosemary and thyme. Pour in the stock and Guinness and use a spatula to scrape up any brown bits on the bottom of the pan. Turn the heat to medium low, cover, and allow the mixture to gently simmer for 1-1.5 hours or until the beef is fork tender. Taste and season with salt and pepper as needed. Stir the cornstarch mixture into the pot, and bring to a gentle boil, allowing the mixture to thicken for several minutes. Remove from heat. Preheat the oven to 400 degrees. Roll the puff pastry out on a lightly floured surface. Cut it into squares or circles to fit the size bowls you have. Ladle some of the beef mixture into each bowl then top with the puff pastry. Bake in the preheated oven for 15-17 minutes or until pastry is golden and puffed. Serve immediately. 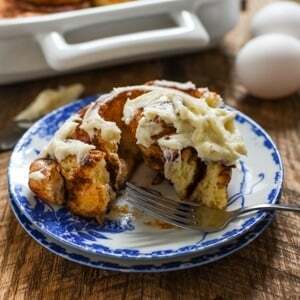 For more savory St. Patrick’s Day recipes, check these out! I really can’t turn down a pot pie, ever! This looks SO good as comfort food, Courtney–love it!!! Oh my, that looks wonderful. My mouth is watering at the thought of tucking in a bowl of Guinness pot pie. Yum. 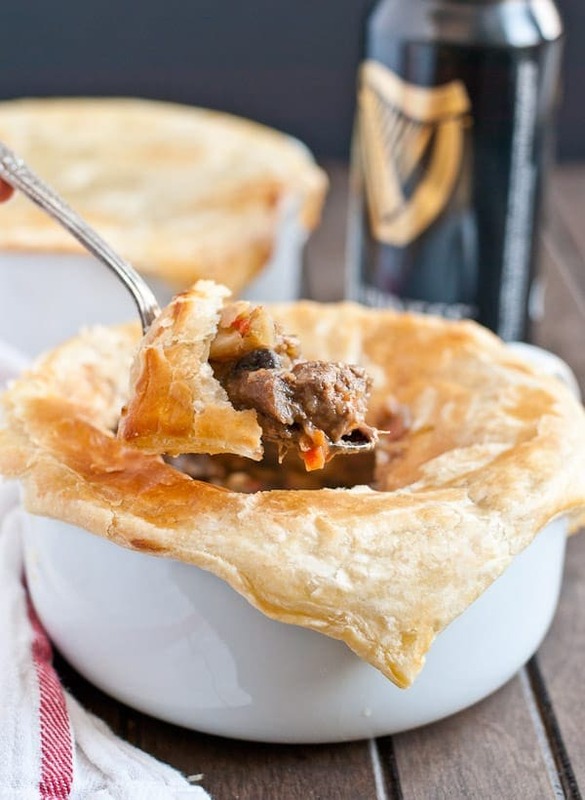 Mmmm, there’s nothing better than beef cooked in beer and tucked under a buttery, flaky crust. This looks amazing. Thanks for including my recipe link! Oh my gosh, I’m going to knit you a puff pastry afghan next chance I get. That is the best idea ever. PS, congratulations on making pot pie look gorgeous and appetizing! No small feat. Haha! You understand that as only a fellow food blogger could. Beef stew is not exactly the supermodel of the food world. Hi Lea, Thank you! I have not made this with other meats before, so I can’t guarantee it will turn out the same. You can certainly sub or remove the vegetables based on what’s available!